What is the Morrison formation? The world-famous Morrison formation is a specific layer of sedimentary rock made up of deposits of sand, mud, and volcanic ash. It formed approximately 141 to 156 million years ago during the Late Jurassic period. This rock is one of the richest dinosaur fossil spots in the United States, usually yielding excellent specimens. It was first discovered near Morrison, Colorado, in the late 1800s—hence its name. 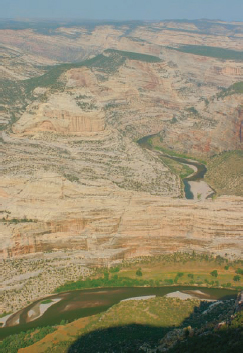 The Yampa and Green Rivers meet at Steamboat Rock in Colorado’s Dinosaur National Monument. This area has proven to be rich in dinosaur fossils (Big Stock Photo).